Browne utilized this intensive training to develop a career as a prominent librarian and archivist, working variously at Harvard University, the Boston Athenaeum, and Smith College. She was also heavily involved with the American Library Association serving in various capacities including being a member of the publishing board. To top things off, this proactive woman invented what was known as the Browne Issue System, a systematic way for loaning library books, used widely in the 1890s. Browne’s interaction with the Grolier Club and the utilization of P. K. Foley, then the leading rare book dealer in American literature, shows her immersion not only in the subject but also her active engagement with the rare book world. A Bibliography of Nathaniel Hawthorne has been superseded by later works, but it still stands as an impressive bibliographical achievement, heightened by its status as quite possibly the first significant bibliography by an American woman. Henrietta Bartlett would serve as private librarian and cataloguer for both Chew and White. Biographical details about Bartlett’s entry into the rare book world are scant but it is likely Terry was involved in some fashion. Bartlett also had a close friendship with Ruth Granniss, the Grolier Club librarian who knew Beverly Chew well. Whatever the point of initiation, Bartlett flourished, working closely with Chew as his private librarian, cataloging his library, and developing an expertise in Shakespeare and Elizabethan literature. Bartlett’s papers and correspondence are at Yale where in the 1920s and 1930s she gave lectures on bibliography, collecting, and rare books. 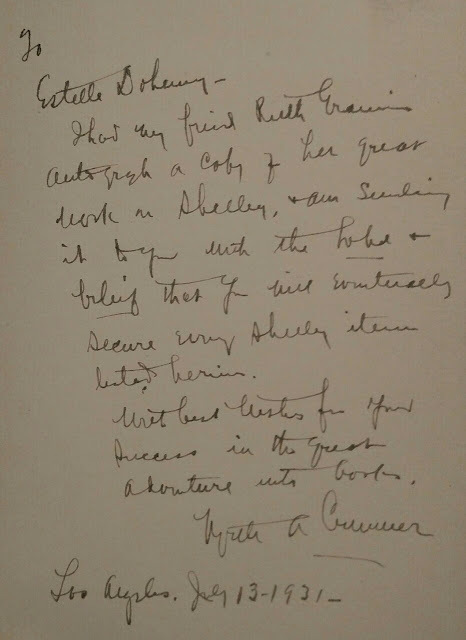 The list of correspondents in the finding aid is extensive and shows that she was in contact with an incredible range of prominent collectors, dealers, bibliographers, and librarians. She was also involved with the Hroswitha Club, an alternative to the Grolier Club for women when the Grolier Club was men only. The earliest bibliographic work credited to her name is A Catalogue of the David N. Carvalho Collection of Incunabula Consisting of a Sequence of Dated Books 1470-1499 Together with a Number of Sixteenth Century Books Compiled and Annotated by Henrietta C. Bartlett (NY: Dodd & Livingston, 1911). Bartlett’s collations and descriptions of the 169 items are extremely detailed and reflect a very high skill level. Booksellers Robert Dodd and Luther Livingston offered Carvalho’s collection en bloc for $10,000. 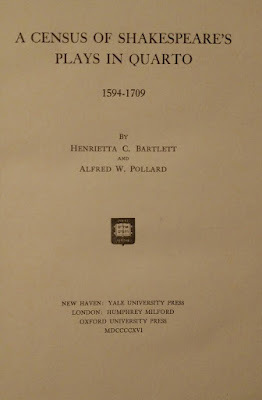 The industrious Ms. Bartlett also authored Mr. William Shakespeare: Original and Early Editions of His Quartos and Folios, His Source Books and Those Containing Contemporary Notices (1922) and Catalogue of Early English books, Chiefly of the Elizabethan Period. Collected by William Augustus White and Catalogued by Henrietta C. Bartlett (1926). Librarian and bibliographer Ruth Granniss (1872-1954) was a close friend of Henrietta Bartlett. As an aside to their bibliographic work, the two women compiled an unusual anthology of poems on the subject of sleep by prominent authors printed in a variety of typefaces titled A Garland of Poppies (NY: De Vinne Press, 1905). Granniss began work at the Grolier Club in New York City in 1903 and in 1906 became librarian, serving in that capacity until 1944. She was heavily involved with the Club’s publications, research, and social activities. However, the only bibliographic publication that credits her on the title-page is A Descriptive Catalogue of the First Editions in Book Form of the Writings of Percy Bysshe Shelley Based on a Memorial Exhibition Held at the Grolier Club from April 20 to May 20, 1922. (NY: The Grolier Club, 1923). 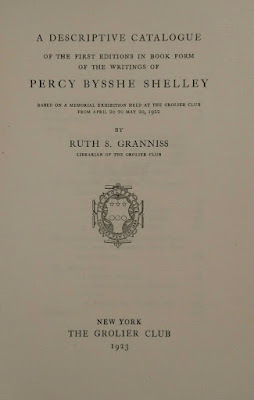 Granniss’ introduction explains the writing of the catalogue and traces the history of Shelley as a collected author among American bibliophiles, many of whom she knew first-hand. A contemporary of Bartlett and Granniss was Flora V. Livingston (1862-1949) who rose to prominence under tragic circumstances. Her husband was highly-regarded bookman and bibliographer, Luther Livingston. The two met through family matchmaking in the 1890s after Luther was laid up for a few weeks due to a bicycle accident. They married in 1898 and shared a passion not only for books but also plants and gardening. As Luther gained prominence in the book world, Flora assisted him with his bibliographic projects. Luther was diagnosed with a rare bone disease in 1912. Treatment was sought and a cure looked promising. In 1914, at the peak of his career, an ailing but seemingly improved Luther was hired to be the first curator of the Widener Library at Harvard. The library was built by the Widener family in honor of their son Harry Widener, an avid book collector and friend of Livingston’s, who perished on the Titanic. On Christmas Eve 1914, Luther Livingston died unexpectedly from his health issues and never assumed his dream job. George Parker Winship, a friend of the Livingston’s and a highly qualified bookman himself, was then selected to become the first curator. In a move both sentimental and brilliant, Flora Livingston was hired as Winship’s assistant. When Winship was promoted to library director in 1926, Flora Livingston became the curator of the Widener Library, a position she held for the next twenty-one years. Flora continued a number of joint bibliographic projects begun with her husband and developed others independently. 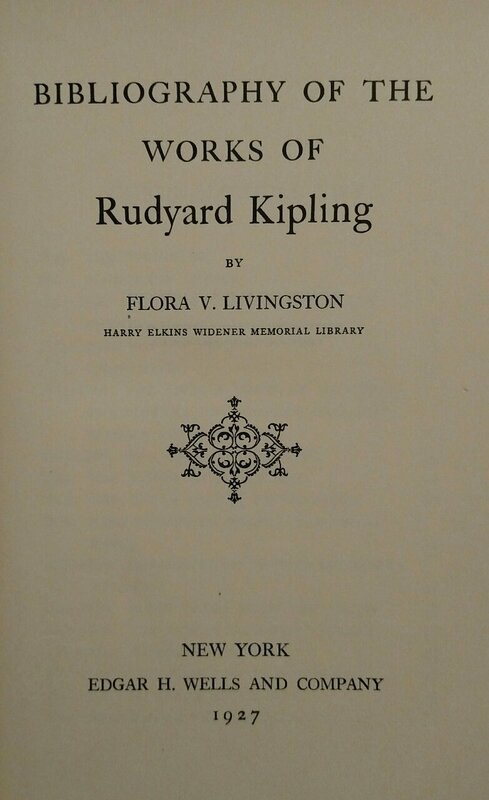 She also avidly pursued the subject of Rudyard Kipling and the resulting Bibliography of the Works of Rudyard Kipling (NY: Edgar H. Wells & Company, 1927) and the supplement volume (Cambridge: Harvard University Press, 1938)—over 900 pages total-- show Flora in full command of her skills. This interest in Lewis Carroll eventually resulted in the important bibliographic work by Livingston, The Harcourt Amory Collection of Lewis Carroll in the Harvard College Library (Cambridge: Privately Printed, 1932). 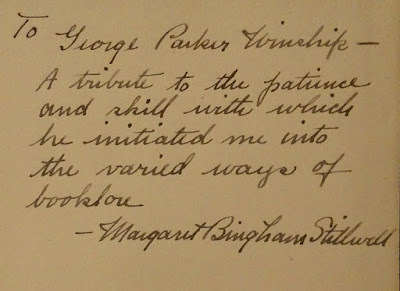 Margaret Stillwell (1887-1984), another prominent bibliographer, shared a common link with Flora Livingston via her connection with George Parker Winship. Winship was the librarian of the John Carter Brown Library at Brown University before becoming curator at the Harvard’s Widener Library. Winship hired Stillwell as his “assistant in training” in 1907 during her sophomore year of college at Brown. 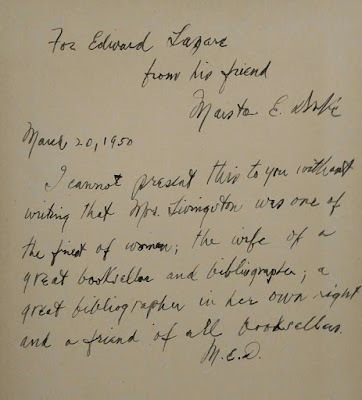 She worked closely with him for seven years until 1914, when at Winship’s urging she took advantage of an opportunity to work at the New York Public Library with the great bibliographer, Wilberforce Eames. 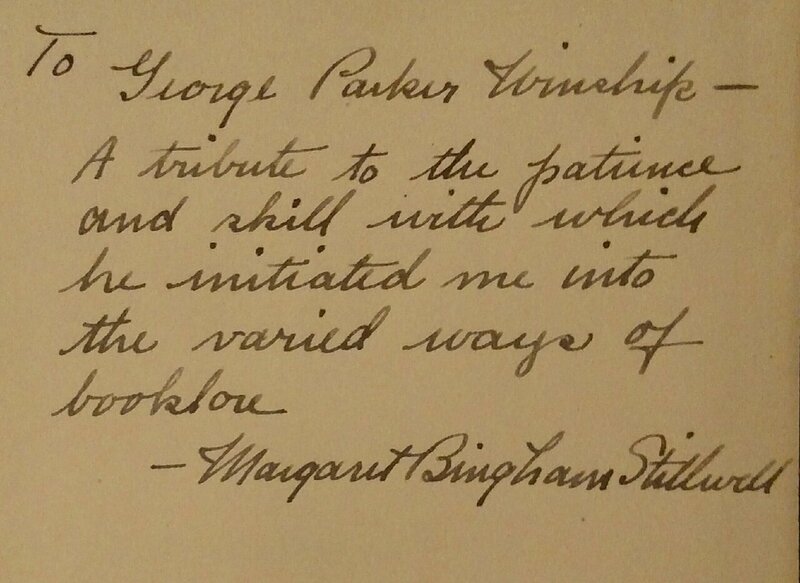 Under Winship’s and Eames’ tutelage she became one of the top women in the rare book field. Stillwell served most of her career as librarian /curator of the Annmary Brown Memorial Library at Brown University. The library contained the collection of Civil War hero and incunabula collector, Rush Hawkins (1831-1920). Hawkins’ early printed books were not the only thing stored at the library. After his death, his ashes were entombed within along with those of his wife. 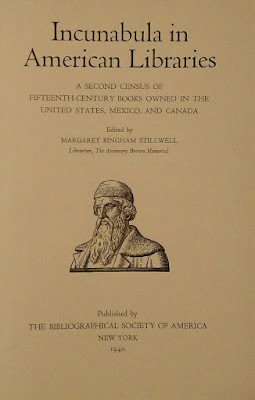 Stillwell’s most well-known bibliographic contribution was Incunabula in American Libraries: A Second Census of Fifteenth-Century Books Owned in the United States, Mexico, and Canada. (NY: The Bibliographical Society of America, 1940). Although published in 1940, she began work on the Census in the 1920s, building upon work begun by her mentor, Winship. The Census compilation was tedious and exacting and resulted in much contact with a wide variety of librarians and collectors. As one bibliographer seems to beget another, a young Frederick Goff (1916-1982), a student at Brown, worked as an “assistant in training” with Stillwell on the Census project. Goff would eventually go onto a prominent career as Chief of the Rare Books Division at the Library of Congress. 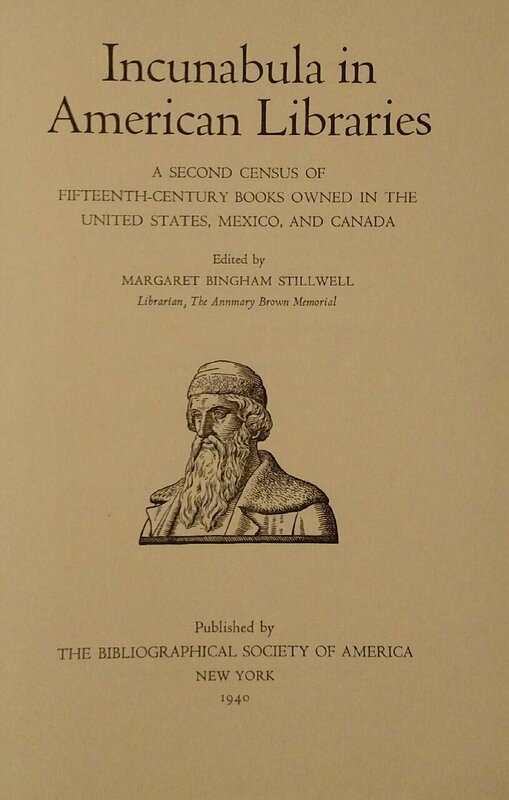 Goff carried on Stillwell’s work and edit the third edition of the Census published in 1964. Stillwell in her autobiography Librarians are Human: Memories In and Out of the Rare Book World, 1907-1970 (1973) recalls the Census work. On a wider scale, her recollections provide a unique view from a woman’s perspective of a male dominated field. The book is scarce and deserves to be reprinted. A number of other American women bibliographers received title-page credit for their work in the 1920s and 1930s. Writer and novelist Carolyn Wells (1862-1942) was an avid book collector who formed an excellent collection of Walt Whitman (now at the Library of Congress). She co-authored with New York collector and bookseller, Alfred F. Goldsmith A Concise Bibliography of the Works of Walt Whitman with a Supplement of Fifty Books about Whitman. (Boston: Houghton Mifflin Company, 1922). Lucy Eugenia Osborne (1879-1955) began her career in rare books as a cataloguer and assistant to New York bookseller Lathrop Harper, one of the most prominent dealers of his time. She would go on to become the first Custodian / Librarian of the Chapin Library at Williams College. Her work The Chapin Library at Williams College: A Short-Title List. (Portland, ME: The Southworth-Anthoensen Press, 1939) only scratched the surface of her extensive bibliographical knowledge. My explorations turned up other works of which little biographical information about the bibliographer was readily available. One example includes Bertha Coolidge’s A Catalogue of the Altschul Collection of George Meredith in the Yale University Library (Privately Printed: 1931). Coolidge is also recorded by Alexander Wainwright as the anonymous compiler of Morris L. Parrish’s A List of the Writings Of Lewis Carroll [Charles L. Dodgson]in the Library at Dormy House, Pine Valley, New Jersey (Privately Printed: 1928). Nina E. Browne. A BIBLIOGRAPHY OF NATHANIEL HAWTHORNE. Boston: Houghton, Mifflin and Company, 1905. Henrietta C. Bartlett. A CATALOGUE OF THE DAVID N. CARVALHO COLLECTION OF INCUNABULA CONSISTING OF A SEQUENCE OF DATED BOOKS 1470-1499 TOGETHER WITH A NUMBER OF SIXTEENTH CENTURY BOOKS COMPILED AND ANNOTATED BY HENRIETTA C. BARTLETT. New York: Dodd & Livingston, 1911. Henrietta C. Bartlett & Alfred W. Pollard. A CENSUS OF SHAKESPEARE’S PLAYS IN QUARTO, 1594-1709. 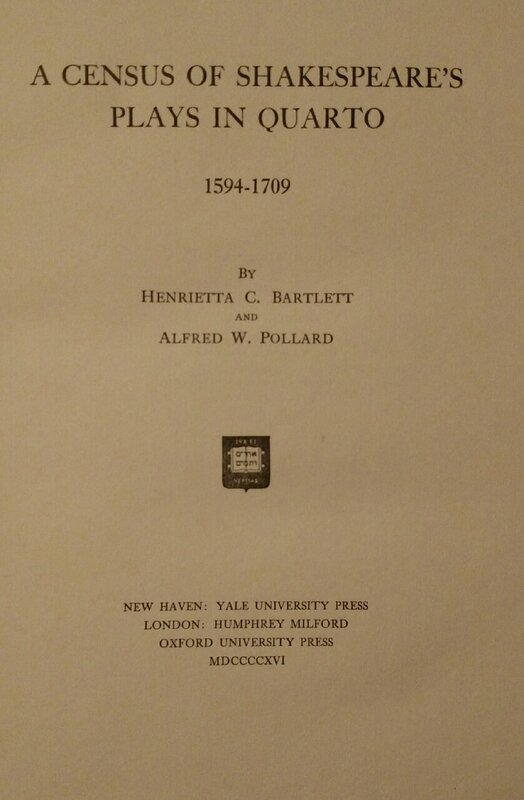 New Haven: Yale University Press, 1916. Revised edition by Bartlett published in 1939. Mary Fowler. CORNELL UNIVERSITY LIBRARY. CATALOGUE OF THE PETRARCH COLLECTION BEQUEATHED BY WILLARD FISKE. London: Oxford University Press, 1916. Flora V. Livingston. Colonel W. F. Prideaux and Mrs. Luther S. Livingston. 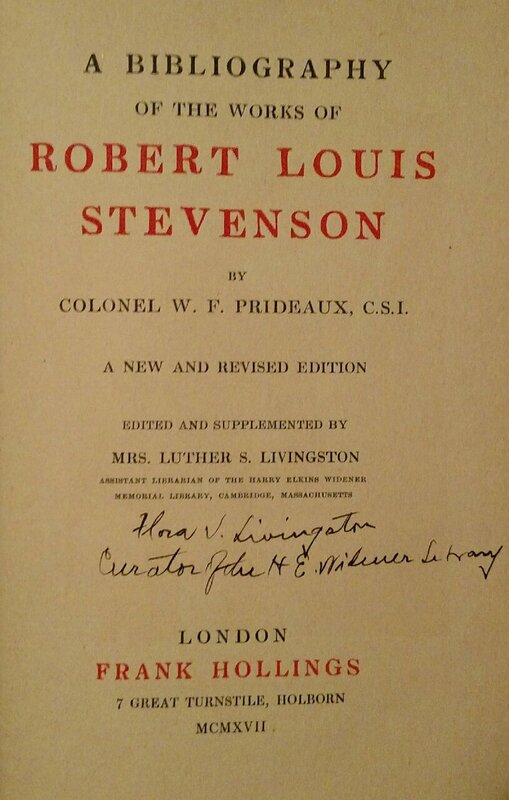 A BIBLIOGRAPHY OF THE WORKS OF ROBERT LOUIS STEVENSON. London: Frank Hollings, 1917. 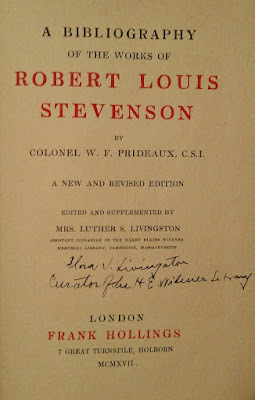 Edited and Supplemented by Mrs. Luther [Flora] S. Livingston. Mary Fowler. CATALOGUE OF THE DANTE COLLECTION PRESENTED BY WILLARD FISKE. ADDITIONS 1898-1920. Ithaca, NY: Cornell University Library, 1921. Henrietta C. Bartlett. MR. WILLIAM SHAKESPEARE: ORIGINAL AND EARLY EDITIONS OF HIS QUARTOS AND FOLIOS, HIS SOURCE BOOKS AND THOSE CONTAINING CONTEMPORARY NOTICES. New Haven: Yale University Press, 1922. Carolyn Wells & Alfred Goldsmith. A CONCISE BIBLIOGRAPHY OF THE WORKS OF WALT WHITMAN WITH A SUPPLEMENT OF FIFTY BOOKS ABOUT WHITMAN. Boston: Houghton Mifflin Company, 1922. Ruth S. Granniss. 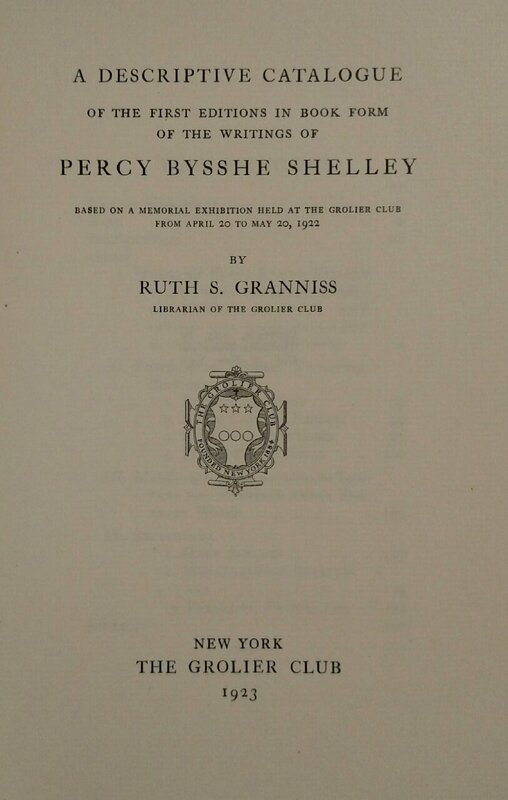 A DESCRIPTIVE CATALOGUE OF THE FIRST EDITIONS IN BOOK FORM OF THE WRITINGS OF PERCY BYSSHE SHELLEY BASED ON A MEMORIAL EXHIBITION HELD AT THE GROLIER CLUB FROM APRIL 20 TO MAY 20, 1922. New York: The Grolier Club, 1923. Henrietta C. Bartlett. CATALOGUE OF EARLY ENGLISH BOOKS, CHIEFLY OF THE ELIZABETHAN PERIOD. COLLECTED BY WILLIAM AUGUSTUS WHITE AND CATALOGUED BY HENRIETTA C. BARTLETT. New York: Privately Printed for Mr. W. A. White, by the Pynson Printers, Inc. 1926. Verna B. Grimm. A BIBLIOGRAPHY OF BOOKPLATE LITERATURE. Spokane: Public Library, 1926. Edited by George W. Fuller. Bibliographic Work by Verna B. Grimm. Margaret Hastings Jackson. CATALOGUE OF THE FRANCES TAYLOR PEARSONS PLIMPTON COLLECTION OF ITALIAN BOOKS AND MANUSCRIPTS IN THE LIBRARY OF WELLESLEY COLLEGE. Cambridge: Harvard University Press, 1929. Clara Louisa Penney. LIST OF BOOKS PRINTED BEFORE 1601 IN THE LIBRARY OF THE HISPANIC SOCIETY OF AMERICA. NY: The Hispanic Society, 1929. (also see under 1938). Emily Ellsworth Ford Skeel. MASON LOCKE WEEMS: HIS WORKS AND WAYS IN THREE VOLUMES. A BIBLIOGRAPHY LEFT UNFINISHED BY PAUL LEICESTER FORD. NY: [The Plimpton Press], 1929. E. Miriam Lone. SOME NOTEWORTHY FIRSTS IN EUROPE DURING THE FIFTEENTH CENTURY. NY: Lathrop C. Harper, 1930. Lone was English by birth but served as chief cataloguer for over thirty years of noted New York dealer Lathrop Harper. Bertha Coolidge. A CATALOGUE OF THE ALTSCHUL COLLECTION OF GEORGE MEREDITH IN THE YALE UNIVERSITY LIBRARY. Privately Printed: 1931. (also see under Bertha Coolidge Slade, 1937). Ruth Elvish Mantz. THE CRITICAL BIBLIOGRAPHY OF KATHERINE MANSFIELD. New York: Ray Long & Richard R. Smith, Inc., 1931. Margaret Stillwell. 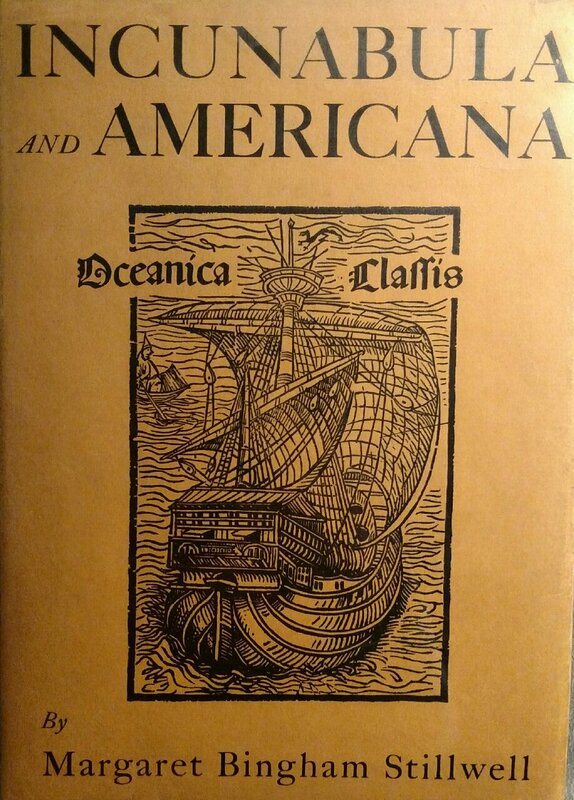 INCUNABULA AND AMERICANA, 1450-1800: A KEY TO BIBLIOGRAPHICAL STUDY. New York: Columbia University Press, 1931. Bertha Coolidge Slade. MARIA EDGEWORTH, 1767-1849: A BIBLIOGRAPHICAL TRIBUTE. London: Constable, 1937. Clara Louisa Penney. LIST OF BOOKS PRINTED 1601-1700 IN THE LIBRARY OF THE HISPANIC SOCIETY OF NEW YORK. NY: Hispanic Society, 1938. (Also see under 1929). Katherine Golding Bitting. GASTRONOMIC BIBLIOGRAPHY. San Francisco: [A.W. Bitting], 1939. Lucy Eugenia Osborne. THE CHAPIN LIBRARY AT WILLIAMS COLLEGE: A SHORT-TITLE LIST. Portland, ME: The Southworth-Anthoensen Press, 1939. Margaret Stillwell. 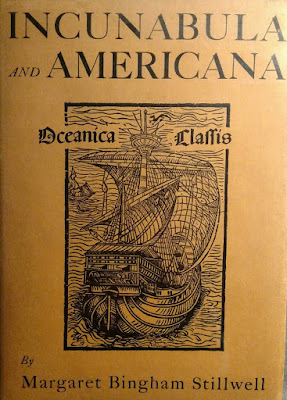 INCUNABULA IN AMERICAN LIBRARIES: A SECOND CENSUS OF FIFTEENTH-CENTURY BOOKS OWNED IN THE UNITED STATES, MEXICO, AND CANADA. New York: The Bibliographical Society of America, 1940. Granniss's Shelley Bibliography signed and then presented to Estelle Doheny by Myrtle Crummer. 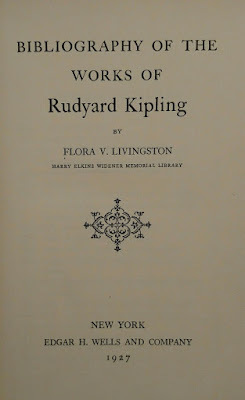 Livingston's Bibliography of Kipling presented to bookman Edward Lazare from bookseller Marston E. Drake. 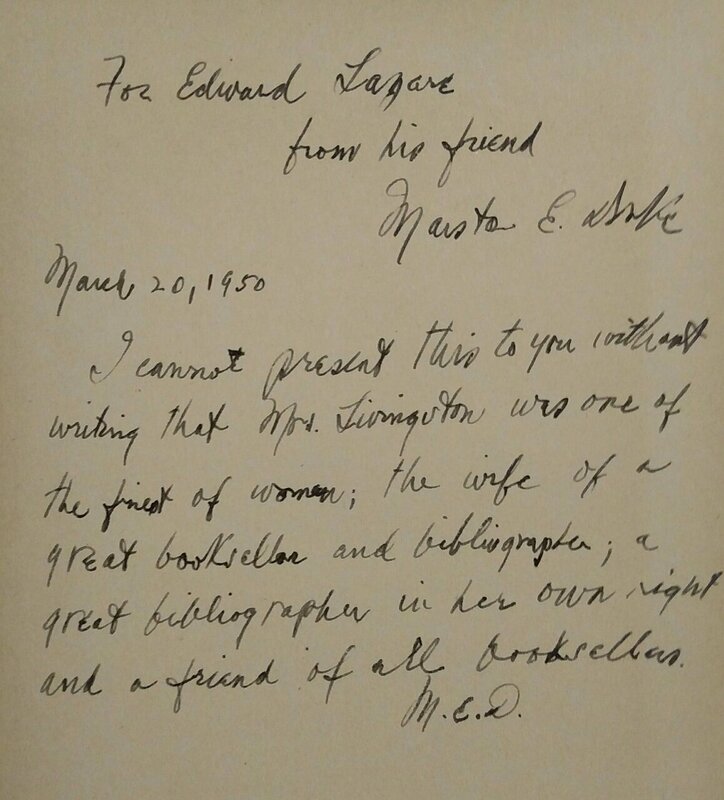 Drake writes, "I cannot present this to you without writing that Mrs. Livingston was one of the finest of women; the wife of a great bookseller and bibliographer; a great bibliographer in her own right and friend of all booksellers."